America Revealed: Education for We, the People or For Private Profit? Education for We, the People or For Private Profit? In his press conference today President Obama said the economic focus is no longer saving the economy from crisis, but "jumpstarting" it to make a dent in unemployment. He listed education as one of the pillars of that effort. Later in the press conference he talked about making colleges and universities being open not just to people who are well-to-do, but to all of us. Progressives believe that a We, the People economy works best when we act as a community where "we are all in this together," and watch out and take care of each other. We mutually benefit from this approach: the better off we all are, the better off we all are. Conservatives, on the other hand, believe we should all be on our own, looking out for only ourselves and our families, and it is up to each of us, alone, to take "personal responsibility" for our own success. Our differing approaches to education reflect these different philosophies. Progressives believe that education is good for all of us, and should be available to all of us. We believe that the economy does better when more of us can receive a good education, whether this brings a vocational or advanced degree, in a community college or a university. We try to enact policies that make this education affordable for everyone. Conservatives, on the other hand, believe that "the government" (We, the People) has no business helping people. So they resist providing free public or university education. They call this "socialism." And so America's conflict continues, one side asking for public investment in all of us for the long-term benefit of We, the People while the other side tries to harvest the public good for the short-term benefit of a few. A compromise of sorts has existed in recent decades in which the government helps students get loans, enabling them to go to more expensive schools. But these loans increasingly leave students with a very high debt to pay off after they graduate. In recent years students are graduating with more student loan debt than they can reasonably be expected to pay off. The cost of a college education is rising faster than the cost of medical care and as much as three times as fast as consumer prices in general. But that's just the beginning of the price of admission. This is the story of a debt crisis few are talking about. Americans now owe more on their student loans than they do on their credit cards — a debt fast approaching $1 trillion with no end in sight. Please read the entire CNBC report on the crushing debt load that students are taking on, just to get an education that will help our economy. Total student loan debt exceeds total credit card debt in this country, with $850 billion outstanding, according to Mark Kantrowitz, publisher of FinAid.org and FastWeb.com, websites that provide information about student aid and scholarships. Consumers owe about $828 billion in revolving credit, including credit card debt, according to seasonally adjusted numbers in a report on July credit from the Federal Reserve. "This data confirms what we already know: that many students are struggling to pay back their student loans during very difficult economic times. That's why the Administration has expanded programs like income based repayment and Pell grants to help students in financial need," said U.S. Secretary of Education Arne Duncan. And, of course, along with the for-profit privatization of what should be a public function, and the compromise of federal help for loans comes the companies profiting from federal dollars. "The data also tells us that students attending for-profit schools are the most likely to default," Duncan continued. 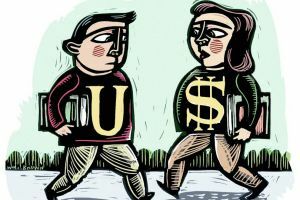 "While for-profit schools have profited and prospered thanks to federal dollars, some of their students have not. Far too many for-profit schools are saddling students with debt they cannot afford in exchange for degrees and certificates they cannot use. This is a disservice to students and taxpayers, and undermines the valuable work being done by the for-profit education industry as a whole," Duncan continued. Along with increasing and crushing debt and defaults another problem has cropped up. Just like with the housing bubble, the private predators have arrived to prey on the public. Private schools like Kaplan University are increasingly scamming their students with schemes reminiscent of the worst of the housing bubble, running up loan debt greater than any job they would ever get could pay, even hitting them with excessive fees and outright fraudulent charges. A Huffington Post report of their investigation of Kaplan University, At Kaplan University, 'Guerilla Registration' Leaves Students Deep In Debt, exposes Kaplan's practice of "guerilla registration" in which they register students and charge them tuition for classes they don't want or take, even in some cases after they have withdrawn from the school. And then they send the debt collectors after them for the money. Despite having attended only two online sessions, Castillo had remained officially enrolled at Kaplan for nearly a year after her withdrawal. Far from an aberration, Castillo's experience typifies the results of a practice known informally inside Kaplan as "guerilla registration": academic advisors have long enrolled students in classes they never take, without their consent and sometimes even after they have sought to withdraw from the university, in order to maximize the company's revenues, according to interviews with former employees. Please read the whole Huffington Post report, there is much, much more there. Kaplan University, by the way, is owned by The Washington Post company. Sending a sharp warning to employers nationwide, the Equal Employment Opportunity Commission sued the Kaplan Higher Education Corporation on Tuesday, accusing it of discriminating against black job applicants through the way it uses credit histories in its hiring process.
. . . In the E.E.O.C.’s suit, which was filed in federal district court in Cleveland, the agency said that since at least January 2008, Kaplan had rejected job applicants based on their credit history, with a “significant disparate impact” on blacks.
. . . The E.E.O.C. typically brings discrimination cases only when it is convinced that serious abuse has occurred. Elizabeth Warren’s Student Loan Forgiveness Plan Mostly Helps the Middle Class, Think Tank Finds - Earlier this week, Sen. Elizabeth Warren became the first major Democratic presidential candidate to support mass student loan forgiveness.